Posted under Health Guides. Updated 18 January 2019. How can I still eat my favorite foods? 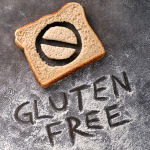 Eating and baking gluten–free has become much easier than in the past as more companies now make gluten–free foods. You can now buy gluten–free breads, rolls, pizza–crusts, buns, bagels, donuts, cookies, muffins, pretzels, cereals, and desserts. The following list of brands has a great selection of gluten–free foods which you can buy directly from their websites or at many grocery stores. How do I shop for gluten–free foods at the grocery store? Many grocery chains carry the gluten–free brands mentioned above. These products are commonly found in the aisles that contain natural and organic foods or they may even have their own section, labeled “gluten free foods.” Often gluten-free bread, bagels, and prepared food is found in the freezer. It’s also important to remember that most of the fresh foods found along the perimeter of the store (outside aisles) including fruits, vegetables, meat, poultry, fish, and dairy are naturally gluten–free. Rice, beans, peanut butter, nuts, cooking oils, and corn and rice cereals are also typically gluten–free. Watch for possible gluten cross–contamination. This means foods that have gluten in them come in contact with gluten–free foods. Be aware of gluten cross–contamination at deli’s, buffets, and salad bars.